The thin paper hexagonal-shaped nest (comb) is often found under a building overhang. 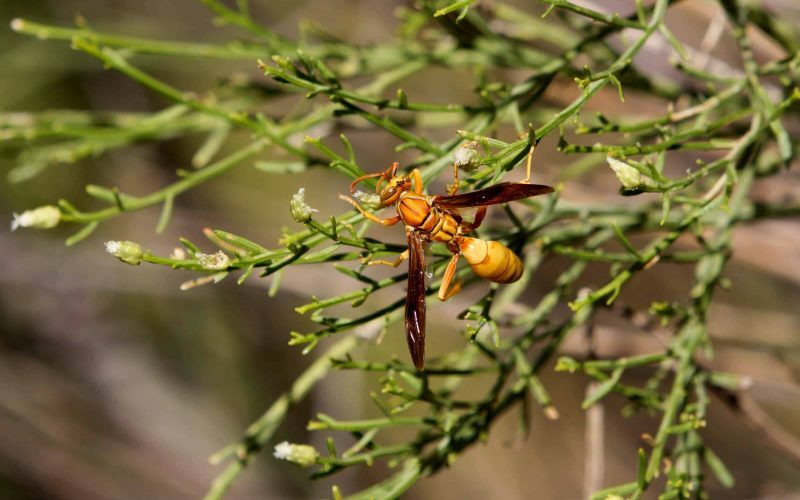 These large wasps are easy to recognize by their bright gold color. The word ‘flavus’ is Latin for yellow or golden. They are found in abundance in Arizona in the same region as Saguaro cacti. Polistes wasps have a characteristic flight with long legs dangling below the body. The wasp(s) in the photos are female; only the females sting. Males have much longer antennae and the ends have a sharp right angle bend. Female faces are triangular whereas the male faces are more square and paler. The thin paper hexagonal-shaped nest (comb) is often found under a building overhang and is attached by a petiole-like structure. In spring, the female chews wood fibers which when mixed with saliva forms the ‘paper’ to make the hexagonal-shaped cells. The mandibles are able to precisely calibrate the thickness of the cell walls. Males and queens mate in the fall. The males die but the queens overwinter and begin nest building in the spring. The queen (foundress) lays her eggs in the tops of the cells and expands the nest as needed. She may be assisted by a close female relative. The larvae are fed caterpillars and other insects by the queen (and assisting females). The adults obtain carbohydrate from nectar of plants such as Seep Willow and Desert Broom. Eventually the larva caps the cell with a white, silky material and pupation begins. In the labeled photo eggs, larvae and capped cells are visible. The first brood emerges in early summer. They are all females and become subordinate workers who help to care for future offspring, nest maintenance and food gathering. At this point any assisting females are driven off by the queen and may then build their own nests or attempt to take over another nest. A later brood will contain females capable of reproduction. Then, finally reproductive males emerge and mating occurs. As workers and males die off, groups of up to 50 fertilized females may seek a sheltered location (hibernaculum) in which to spend the winter. The nest in the photograph was under the overhang at the rear of the bathroom in the circle in Lower Sabino Canyon.